This is a delicious sauce that really hits the spot, especially once it has been cooked. It is really spicy if you try a small amount out of the bottle, but after it’s cooked, it really loses its spicy bite. The sauce is red with darker red speckles throughout. It has a runny thin texture, so be sure to shake before using. At first taste, it has a super spicy kick, but after it’s cooked, it becomes a well-rounded delicious sauce. It left me craving more. 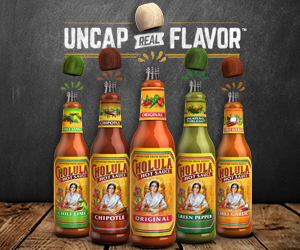 The heat comes from the Jalapeño peppers, but really calms down after cooking the sauce for just 30 seconds. The sauce has only natural ingredients, each adds just the right pinch of balance. All in all, it’s a delicious sauce with a very rounded flavor that leaves your mouth wanting more. I was pleasantly surprise with this tasty mix of flavors. This sauce is thin, runny, and dark red. It has darker red speckles throughout. It’s made of all natural ingredients and may start to separate, be sure to shake before using. Like I said, Yellowbird Jalapeño Hot Sauce is thin so it’s perfect as an added sauce to spice things up. You don’t need much to add flavor. It’s a sweet but spicy scent with a tiny hint of vinegar and lime smell. There is a uniqueness to the scent of Yellowbird Jalapeño sauce; I think it’s because of the carrot ingredient. 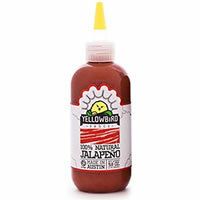 Yellowbird Jalapeño sauce is super spicy when you try it right from the bottle. It has a kick that lasts. Once the sauce cooks, the spicy factor really fades and it loses its bite. Still amazing with great flavors, but not nearly as spicy. This is a delicious sauce. It has a sort of sweet, but spicy taste. It’s definitely a sauce with a kick, so be prepared for those Jalapeño peppers. Yellowbird Jalapeño sauce has all natural ingredients- Jalapeño Peppers, Organic Carrots, Organic Distilled Vinegar, Onions, Garlic, Organic Cane Sugar, Salt, Lime Juice Concentrate. This mix of ingredients really rounds out the taste. The jalapeño peppers bring the spice while the sugar and carrots balance the flavor. When we added Yellowbird Jalapeño Hot Sauce to cooked chicken and allowed it to cook a bit, the sauce developed a well-rounded depth of flavor but lost the spicy bite. I was a little bummed that it wasn’t spicier, but man was the sauce yummy. It had a slight sweetness and a really unique, but rounded flavor. I was beyond pleasantly surprised when I tried the cooked taste. The 9.8 oz bottle costs $8.99. This hot sauce is priced a bit below average. All-in-all its a pretty good deal considering how delicious it is!